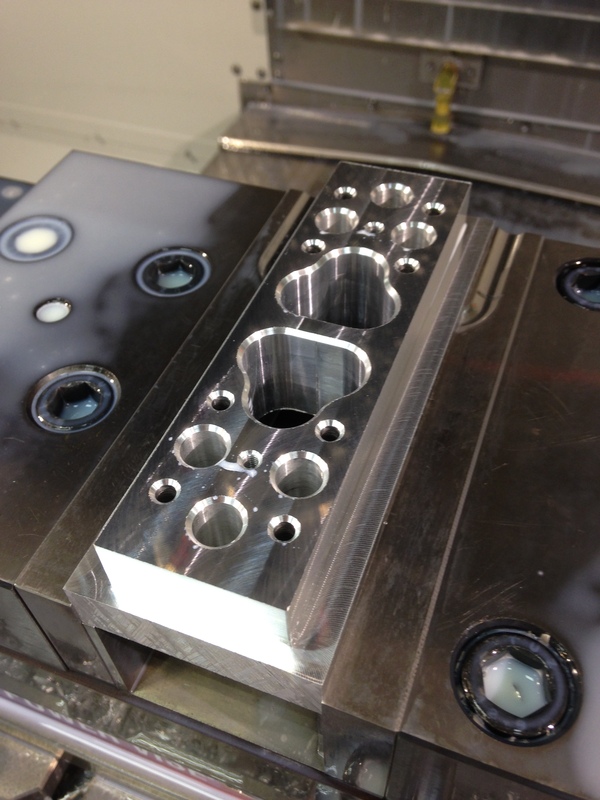 I am fortunate enough to have industrial CNC machinery at my disposal, so it was an obvious choice to machine all of the mechanical parts for this machine myself. This blog post gives a brief overview of the process. 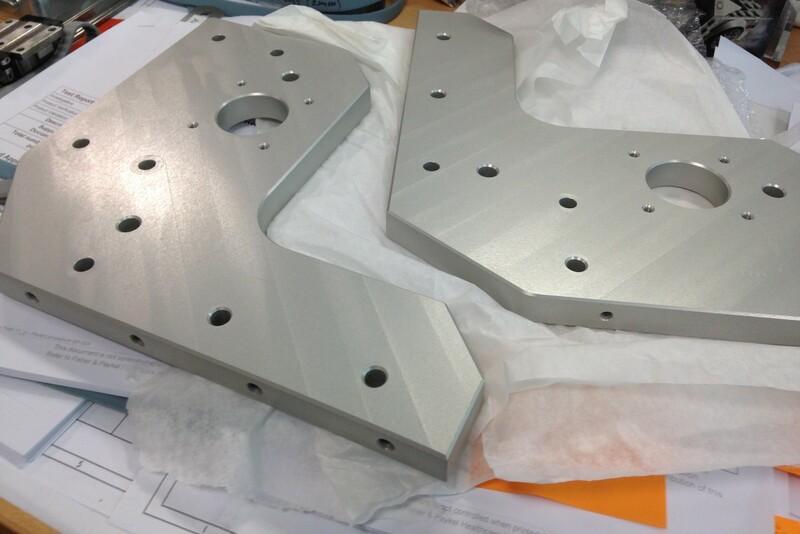 The largest and most challenging components to machine were the Gantry Side Plates. 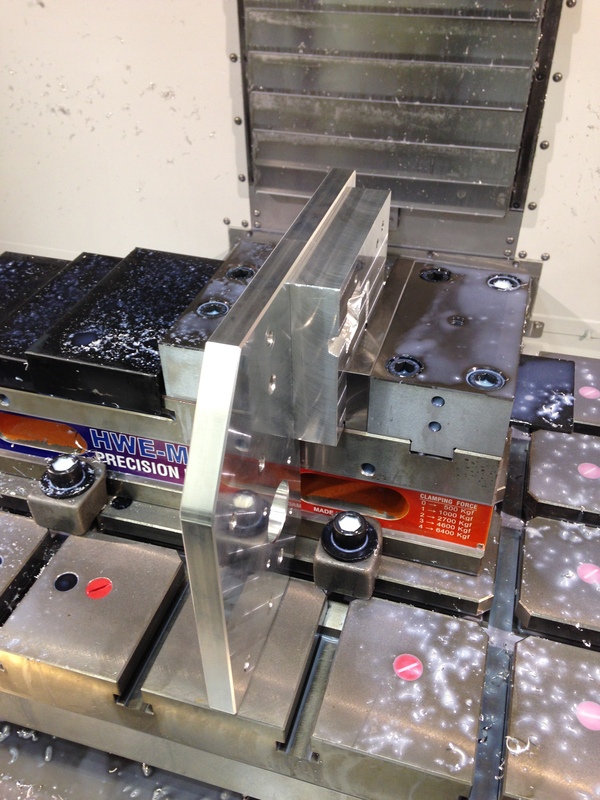 I began with 19 mm 6061 T6 aluminium plate stock and performed a light facing cut on the first side. It was then flipped over, faced once again and drilling/reaming sequences performed. 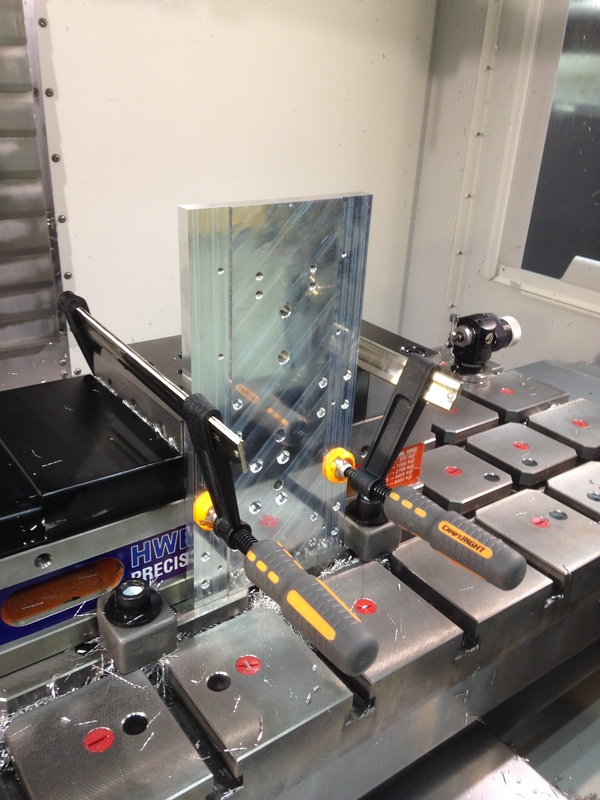 As we have vises permanently installed on the bed of the machine, it makes it difficult to perform external profiling cuts. My solution was to rough cut the outer profile on a band saw by hand and mount the plates onto a fixture using the 10 mm locating dowel holes I drilled previously. 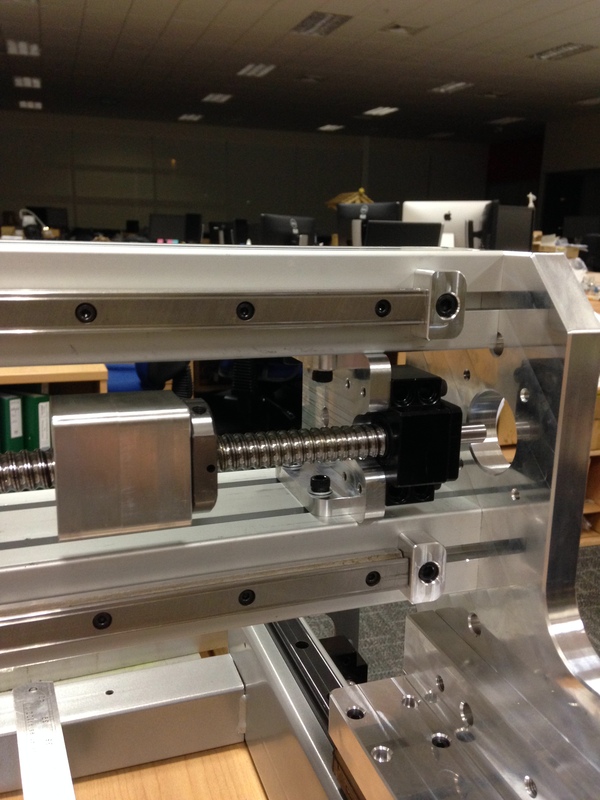 You can see the location dowels in place in the image below, once the bolts were tightened securing the workpiece to the fixture, the dowels were removed and profiling/chamfering of the outside of the component could commence. 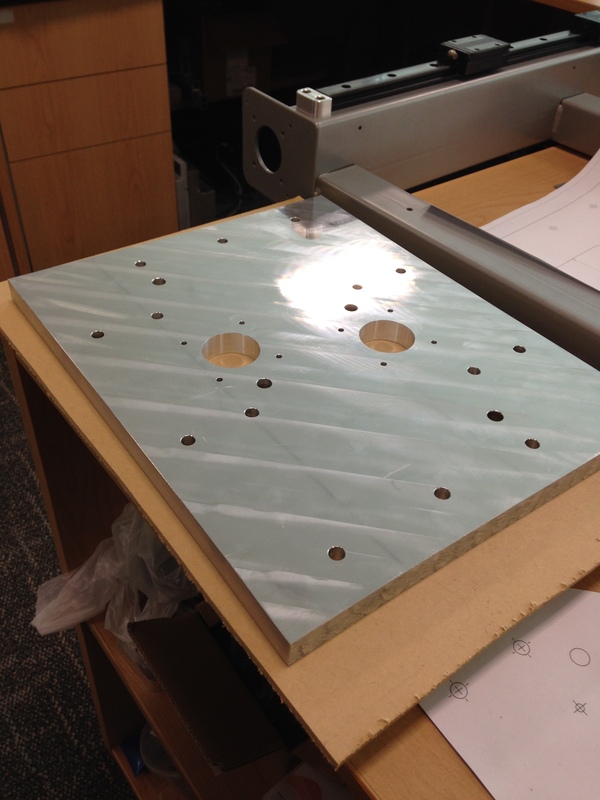 Another challenge which I faced was drilling and tapping into the edges of the Gantry Side Plates, these operations required awkward orientation of the parts in the CNC machine. 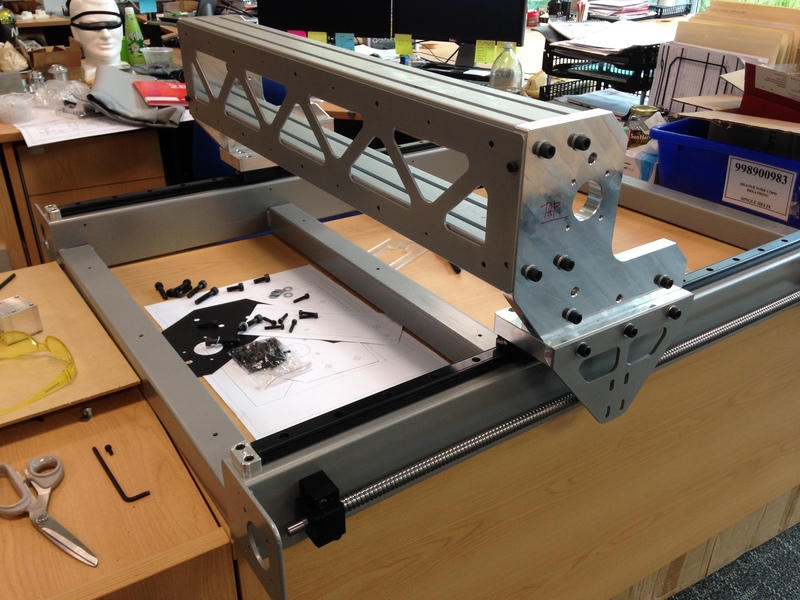 The holes allow attachment to the main Gantry Platforms and the Gantry Bases, therefore their location and accuracy were critical to the assembly of the machine. 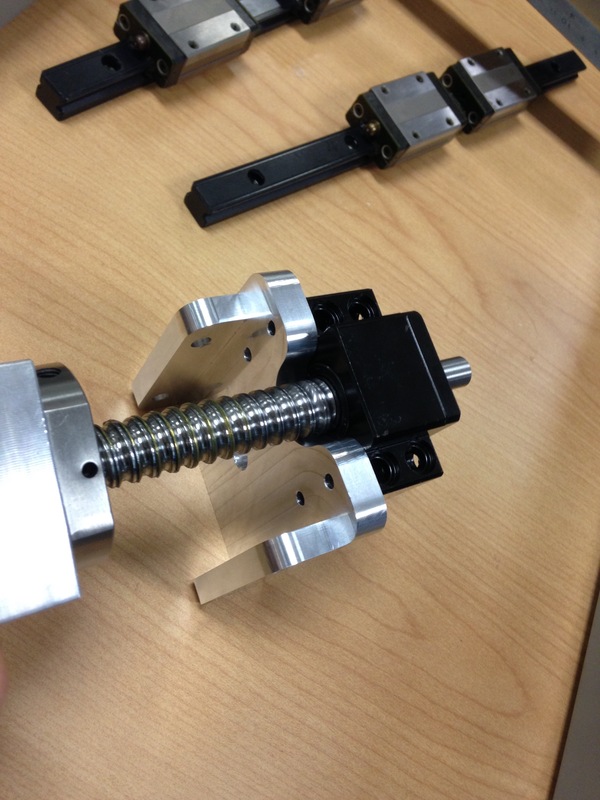 This challenge was overcome once again by bolting a fixture to the component. 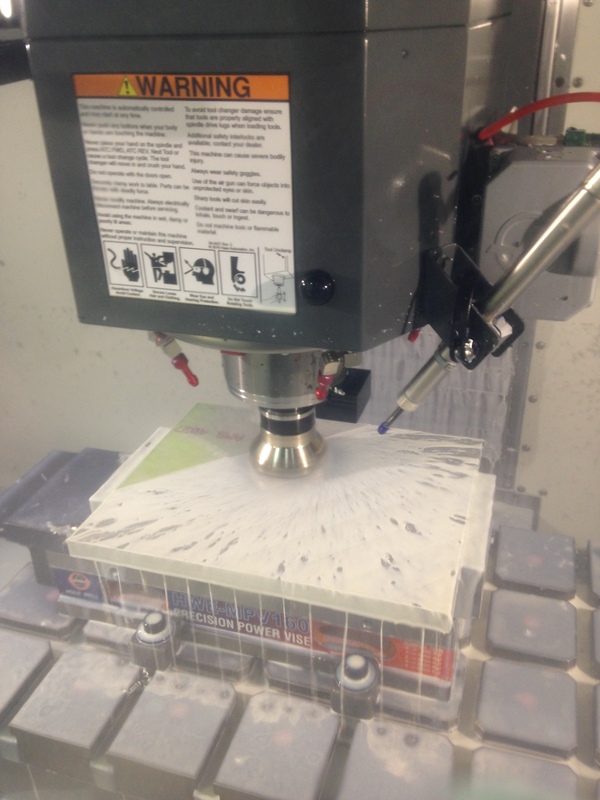 The top edge surface of the component was used to align itself on the bed of the machine whilst the vice firmly held the fixture. 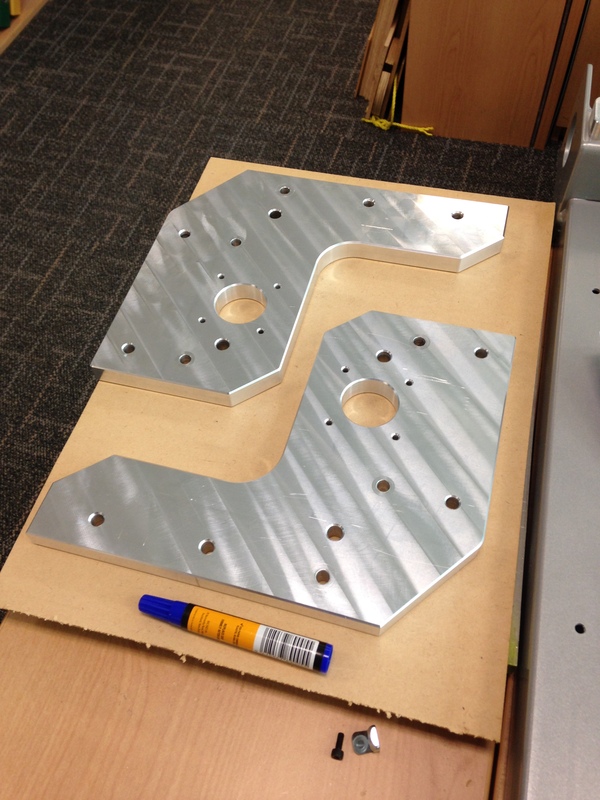 The below images shows a test fitting of the main gantry components. 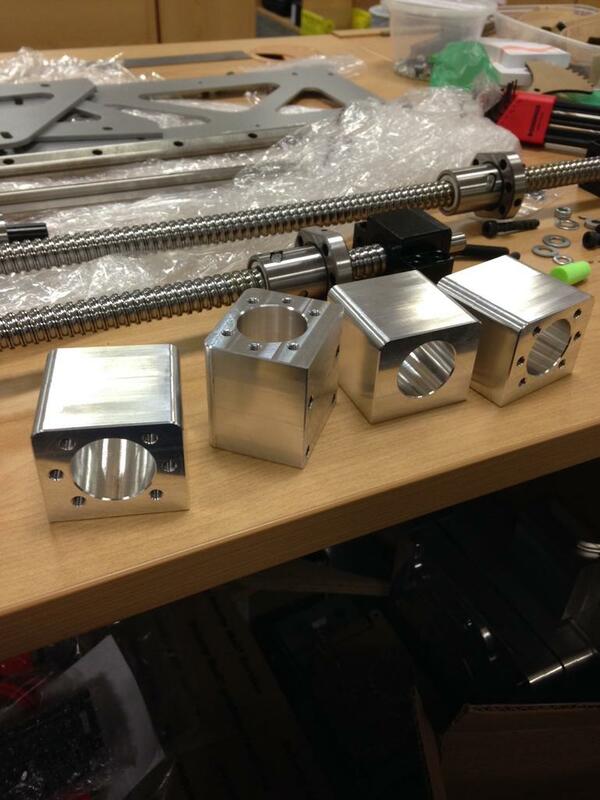 The next task was to begin machining some of the smaller components, ball-screw mounts, ball-nut holders, linear slide end stops, etc. 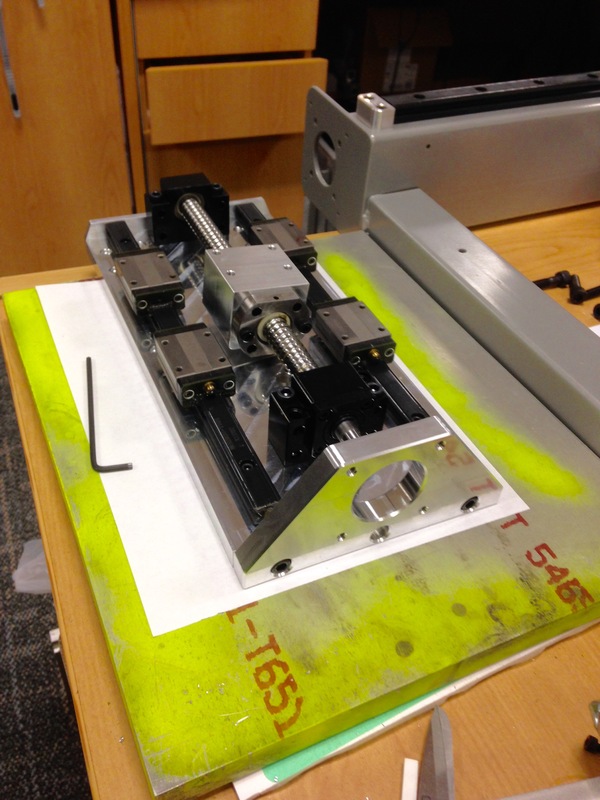 Another interesting machining setup below, using F-clamps to affix the X axis carriage back plate to the side of the vise. 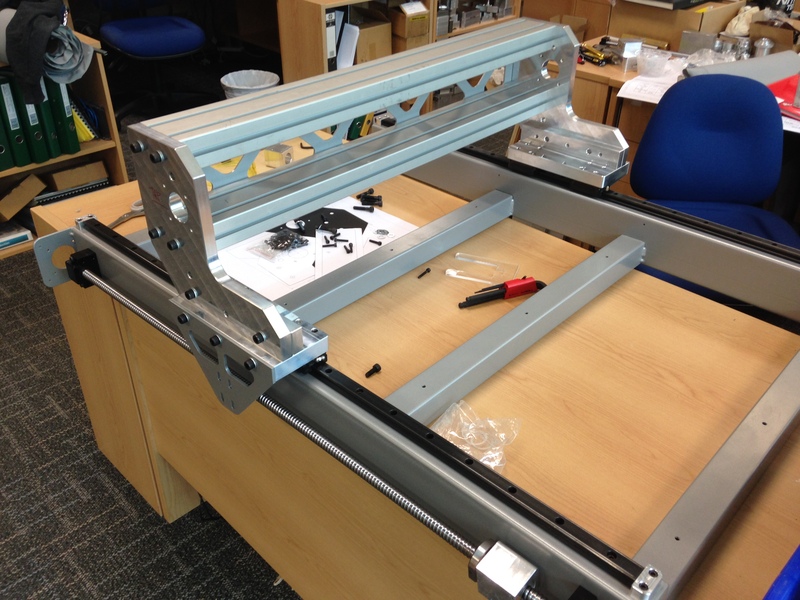 The X axis carriage is a tight fit but turned out nicely I think. 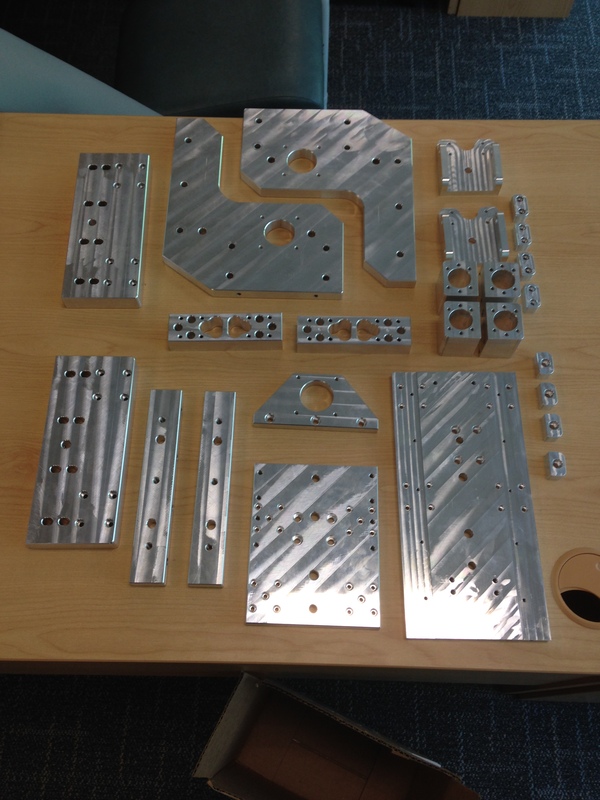 Below is an image showing all of the machined components prior to anodising. I was hesitant about getting the components anodised as it was an extra process which wasn’t necessarily required, but in hindsight I am glad I made the extra effort. They came out with a really nice matte finish and the coating should protect the surface from tarnishing and other marking for many years. Jeremy, nice work. I want to do the same thing by taking the OX open build and personalize it to my style and needs. How is it working? Hi Willie, this machine is working well, haven’t had a lot of time to play around with it lately but getting it dialled in slowly! 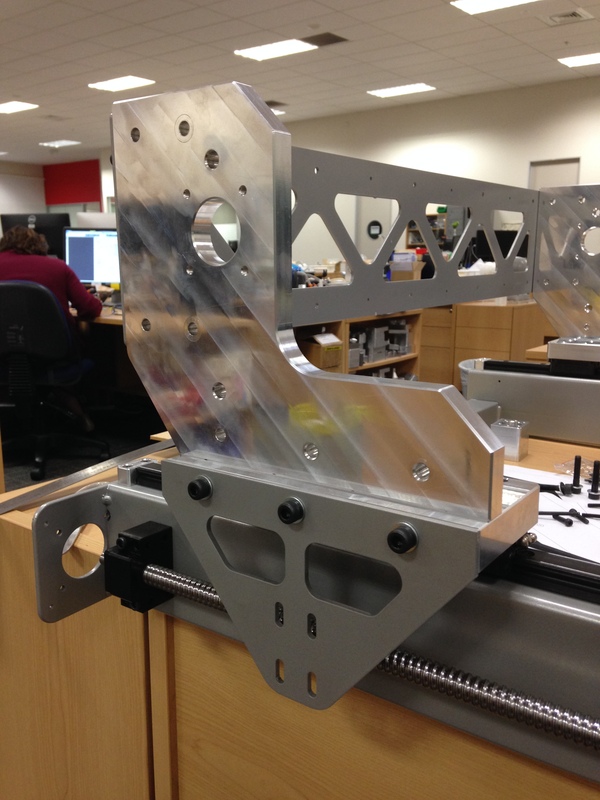 If you look back a bit further on my site you’ll find a post on my first CNC build which was an Openbuilds Ox. Hi, could you tell me how fast this machine is? Do you have any problems with 16mm ball screw? Any resonanse or vibration? I want to build a machine on 1200 x 1000[mm] frame but one of the bounduary condition is to have a G0 feed on 5000-6500[mm/min]. Hi Wojtas, to be honest I haven’t bothered doing much speed testing on my machine, from memory I have the rapids set to 4000m/min, I believe I’ve had them quite a bit higher than that, but set them conservatively for safety reasons. 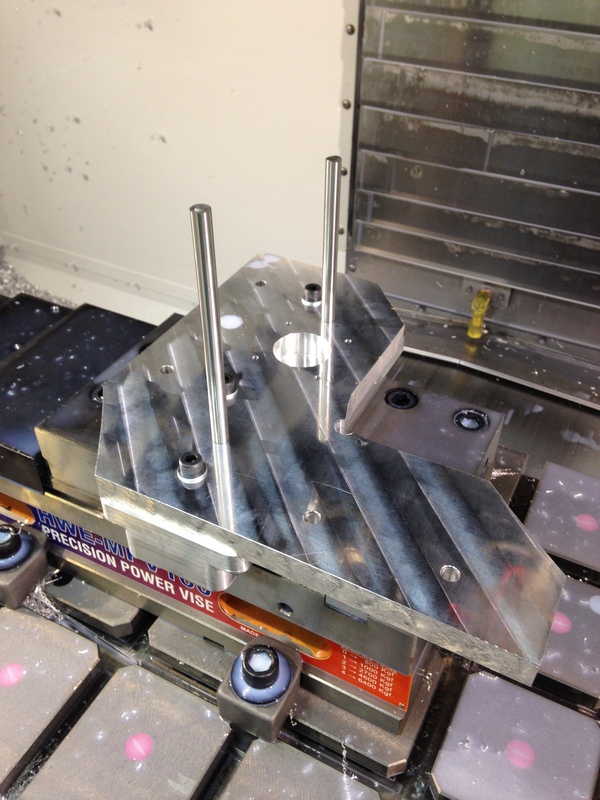 It is mainly used for one off prototyping so high speed machining isn’t a priority. No issues with the 16 mm ball screws, they work well with a machine this size. Anything past 1000m long I think I would start looking at a rack and pinion setup. May I ask why you have set that target? Hi, as i’am wrote, that is a my bounduary condition. When I start thinking/ preparing to do my project a need some data from where i start. That’s one of them. Right know i’am developing next concept of my 3D model, because all the time when I see something interesting i want to change on my model. Main issue is to build a router and don’t spend to much money, so all the time I am looking for new low-cost solutions. I have a lot of questions, if you want to help me, better will be to sent a email than write over here, what you think?